With both Samsung and LG being big on displays, it might have come off as a surprise to see Sony "beat" them to the punch with the Xperia Z5 Premium and its 4K screen. Especially so when you consider that LG was first to the mark with a global Quad HD phone (the LG G3), all the while there's still no Sony device rocking that exact resolution. Typically, you'd think that the two South Korean companies are already working hard on leveling the playing field as far as their Japanese rival is concerned, but a recent (unverifiable) report claims that neither of the two is really interested in pushing 4K on phones any time soon. Whether it's because the disadvantages outweigh the advantages, their tech isn't quite up there yet, or simply because they don't see the point in as many pixels crammed in as small screens, if we assume the report is on target, you'd expect some fans to be disappointed. So we asked you. Turns out, the vast majority of participants —nearly 84%— are perfectly content with Quad HD panels and wouldn't find it disappointing in the least if Samsung and LG go for a pass in 2016. As for the remaining ~16%, 4K displays make sense and Samsung and LG skipping over them is a mistake. If we try real hard, we probably can sympathize —after all, if you do enjoy virtual reality, a 4K display does make sense. For everything else, however? Overkill and not where we'd rather see companies focus their resources and efforts. 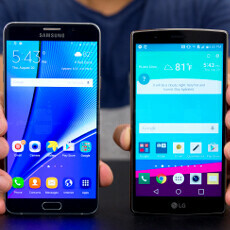 Would you be disappointed if Samsung or LG don't out phones with 4K displays in 2016? There is no point of being disappointing here.. All I want is better display more power efficient.. I want 2016 phones to have awesome battery life, hoping this time SD820 would really help too... Bright Color Accurate display all I want.. I love Nexus 6p display except its not that brighter as my M8, or my friends Note 5.. Agreed, efficiency, color accuracy, and then brightness should be the next steps, in that order. I think Samsung should have at least one version of S series having a 4k display as the hardware and software support needed for a 4k display will reach maturity with the SD 820 and marshmallow. 4k display would be a nice future proof step if done by Samsung and LG in 2016. I would love to see a 4k amoled screen really. I can't believe nobody wants that. Law of diminishing returns. We are to a point where increasing resolution really doesn't help enough to bother. If anything, it hurts the battery more than helping your eyes, so it is a net loss. If we are talking about a 50 inch+ TV, sure, you have a point. I would love to see a 65 inch TV with awesome 4k, but even then it's not completely useful given the unavailability of content. I see no reason to continue increasing pixel count past what the human eye can see. All it does is increase price, decrease battery life, and slows down performance. "Would you be disappointed if Samsung or LG don't out phones with 4K displays in 2016?" -PA (Chris P.) What language is that? "Don't out phones"? Huh? Once again, pathetic piece of writing from PA. It's far too commonplace in the blogosphere to matter any more. What are you trying to prove by being some syntax Nazi? Let's grow up, it doesn't make you seem more intelligent then you actually are. For my opinion, i need performance than 4K Display. i am handing 6S Plus & Note 5 but 6s plus is smoother than Note 5. I love Note 5 and Note 5 display is great, i want Note 6 smoother than iphone. i don't care who is the copycat. I've owned both and the performance when navigating is virtually indistinguishable. Not sure what you're nitpicking about. i dont get it really...sony said 1080p is enough. so didnt launch a 1440p phone n now they r the first with 4k display on a phone !! guess....that's just for limelights & be in the headlines. that is because 4k display has benefits over 2k display. why waste pixels for a 2k when you can directly jump to 4k. but seriously powerusage is a drawback. so sony optimized it with a 1080p rendering for UI. (and also android lollipop doesnt support native 4k rendering). for movies and pics directly jump to 4k. z5 premium has about 10 - 20% less battery life than the z5 even with a larger battery and display .843ppi i think. but believe me even with a 4k display games dont lag on the z5 premium. so i guess samsung should make the move to a 4k display but limit gaming to 2k or FHD so as to increase performance. That's because the game is being rendered in 1080p lol. Fact is, Sony bashed about 2K and jumped right to 4K. Hypocrites. And to top it off, even with a bigger battery, it still can't achieve the same battery life the Z3/Z3+ did. Sony doesn't know what they're doing and heading in the direction HTC did a year ago. You are right . I also don't like how Sony is heading too. They have a crappy series of M ,C and E. They lost the entry level and midrange markets. Z series is okay .but sd 810 is not the best. Nope. But I still think Samsung will dish out a 4k AMOLED screen...making it the best ever. i read somewhere that samsung will launch a 4k phone (dont knwo if s6 or note 5) exclusively in korea !! 1080p is enough. Colors, however, still need improvement. 16M is not enough. We can still see banding in gradients. Things like color accuracy and sunlight legibility can always be improved. I honestly don't see the need for 4K resolution on a 5 to 6 inch screen. All it does is make the processor work harder, drain the battery faster, and you're not really getting an appreciable uptick in viewing quality. Well...after reading most of the comments in here, i'm starting to believe that Sony really did it the right way. Sony said that 1080p is enough for phones and most of the users tend to agree...so, Sony made a phone with a 1080p display and for those who want more they can have it, if they have the right content to use the 4k resolution. Am i right? :D I also think that 4k or 2k aren't really needed on phones right now.....1080p and better battery life is what we need!!! 16% of PA's readers are idiots.